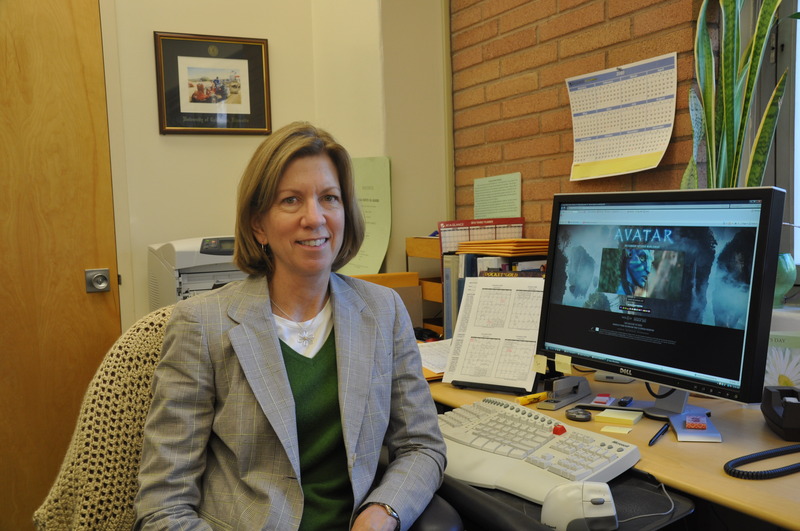 Jodie Holt is a professor of plant physiology and the chair of the Department of Botany and Plant Sciences at UC Riverside. Photo credit: UCR Strategic Communications. To watch a short video of Holt talking about her involvement with the film Avatar, click here. RIVERSIDE, Calif. – One of the much-talked about highlights of James Cameron’s blockbuster film Avatar is the depiction of the lush vegetation on Pandora, the film’s extraterrestrial moon. To present this vegetation credibly in the movie, the filmmakers consulted botanist Jodie Holt of the University of California, Riverside, who served as an expert on Pandora’s plants and provided textual details for the movie’s game products. Briefly, she also mentored actress Sigourney Weaver, who plays a botanist in the film. The public has an opportunity to listen to how Holt got involved with Avatar, how she helped out, and what it was like for her to work with a creative crew of filmmakers. Holt, a professor of plant physiology and the chair of the Department of Botany and Plant Sciences, will address the upcoming Citizens University Committee (CUC) breakfast meeting on Wednesday, Jan. 27, from 7:15 a.m. until 8:30 a.m. at the University Extension, Rooms D/E, 1200 University Avenue, Riverside, Calif. The title of her talk is “A Walk Through Avatar’s Pandora, One Plant at a Time.” Attendees will have an opportunity to ask Holt questions after her talk. “I plan to discuss how my research and teaching informed my collaboration, and how this movie and other aspects of popular culture can be used to teach science, especially botany, to the public,” she said. To watch a short video of Holt talking about her involvement with the film, click here. Also presenting at the breakfast meeting is Ron Loveridge, mayor of Riverside, who will summarize his State of the City address. Others will provide updates on the UC Riverside Homecoming Events and the CUC’s Medical School Campaign. The cost for the event is $18 for members and $22 for non-members, and includes a breakfast buffet. Reservations are required and need to be made no later than Monday, Jan. 25, by contacting the UCR Office of Governmental & Community Relations at (951) 827-5184 or by e-mailing robin.clark@ucr.edu. Holt is a coauthor of Ecology of Weeds and Invasive Plants: Relationship to Agriculture and Natural Resource Management. She is an elected fellow of the American Association for the Advancement of Science and the Weed Science Society of America (WSSA). At the WSSA, she serves as an associate editor of the journal, Invasive Plant Science and Management. She received the UCR Distinguished Teaching Award for 2008-09. Comprised primarily of business and civic leaders, the CUC is a town and gown group that was established more than 50 years ago to bring a University of California campus to Riverside. The CUC works to raise awareness of the university and foster ties between UCR and the community. The group holds monthly breakfast meetings during the academic year which highlight the latest cutting-edge research UCR has to offer; each meeting offers updates that connect UCR with business and the surrounding communities.